There exists no fish worth risking ones life for. It is assumed by many that anytime an angler walks on to a frozen lake that he or she is risking their life. That is not true. Lakes, ponds and bays covered with five or more inches of uniform ice are safe places to explore and fish when conditions allow. Ice uniform in thickness and appearance without large cracks and open water pressure breaks five or more inches thick is safe to traverse. Ice sheets on a lake or bay that are subject to warm weather and ensuing run-off caused by snowmelt can still be safe even when air temperatures hover above freezing for extended periods. Areas on frozen lakes adjacent to open water or moving water are always places to avoid and the closer you approach these areas the more the risk of weak ice. 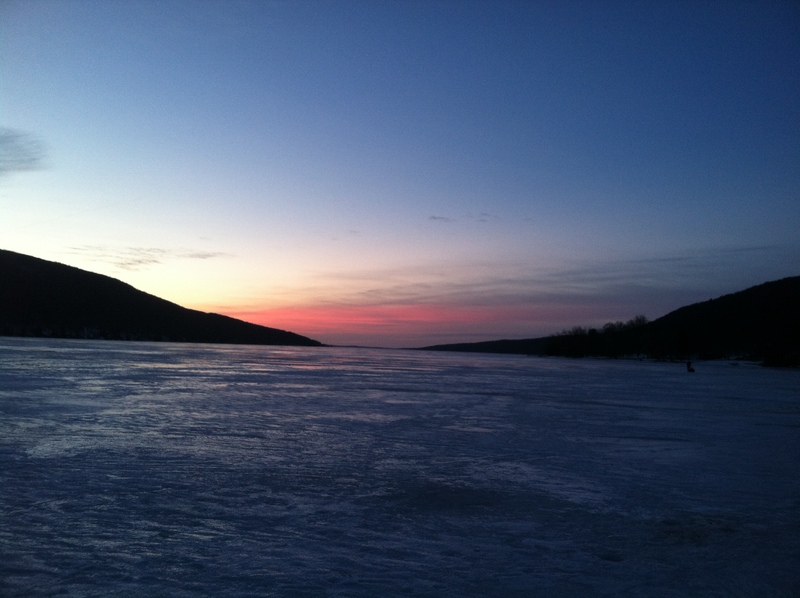 When planning an ice fishing trip on any lake or bay, the angler(s) must be able to identify creek mouths or open water ice edges so they can be avoided while traveling on the ice. Warm air temperatures and longer days in early spring will begin to erode the edges of large sheets of lake ice and will make all areas of the ice sheet near inlets and outlets places to avoid. The main lake ice sheet, however, if thick enough (a foot or more) will remain solid and float strong and intact allowing anglers to continue to ice fish productive areas. The color of ice and texture of its surface, how the ice sounds and acts when you hit it with a spud bar or drill a hole through it with a hand auger gives the experienced angler the necessary clues as to the safety and thickness of ice. A spud bar, a long handled steel rod with a blunt heavy blade welded on one end, is a vital tool for ice anglers on ice that is questionable. The sound and feel made when the ice is struck with the spud bar relays its thickness and safety to the angler traversing the frozen surface of the lake. Every few yards you should stop and smack the ice a few feet in front of you with the spud bar. If you stab the ice two or three times and the spud bar penetrates the ice to water…Turn around and return on the same path. The ice is too thin or soft. Besides ice thickness and condition, the other main factor that is responsible for many ice rescues is inclement weather. A week ago several ice anglers had to be rescued by firemen from the frozen surface of Oneida Lake. These anglers used poor judgment. 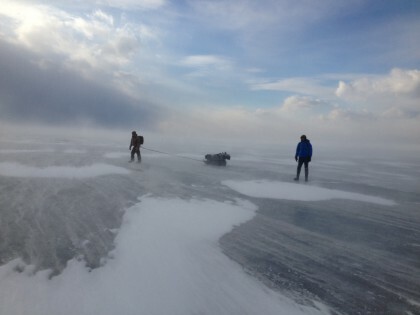 They ventured out on the 50, 000 acre snow covered frozen surface of the vast lake with 30 mile per hour wind gusts and wind chill values up to -20 forecasted. Bad idea. Many rescuers risked their own lives searching for and recovering the stranded and lost ice anglers from a brutal environment of near zero visibility and extreme cold… An environment in which these anglers were not properly prepared to endure or retreat. While the information here is not inclusive of all the factors for a safe and enjoyable trip out on the ice, it is I think good advice. I tell my guests that the most dangerous aspect of an ice fishing trip (with UGS) is getting to and from the launch in their vehicle. Leading anglers onto questionable ice is never an option. Previous Post: The Gear Guru? Not-So-Much.